Daron Dylon Wint arrested in Savopoulos murder. 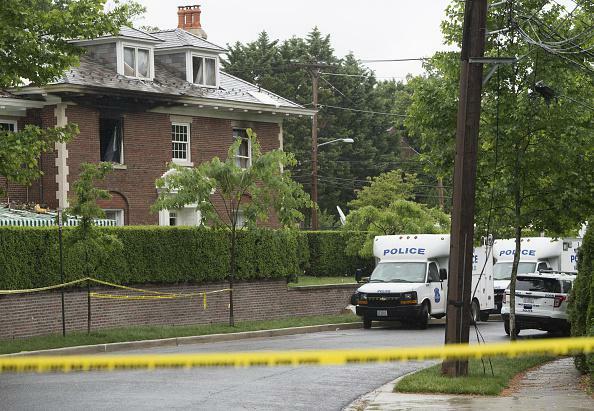 The Northwest Washington, D.C., home where four victims were found dead May 14 after a fire. The primary suspect in the home-invasion murder of a family in Washington, D.C., was arrested late Thursday in D.C. after a manhunt. Daron Dylon Wint, 34, is suspected of killing American Iron Works CEO Savvas Savopoulos, Savopoulos’ wife, their son, and a housekeeper. Their bodies were discovered May 14 after their home in Northwest D.C. was apparently set on fire; authorities believe Wint took them captive on May 13. Savvas Savopoulos’ assistant brought $40,000 to the home on the morning of May 14 before the fire and the discovery of the bodies. Both vehicles were stopped by marshals near 10th Street and Rhode Island Avenue NE, the official said. Police found at least $10,000 in cash in the box truck, and the women in the Cruze and the men in the box truck were taken into custody, the source said. The manhunt for Wint had extended to New York City, where authorities said he has relatives and acquaintances in Brooklyn. Wint, who grew up in Guyana and moved to the United States in 2000, has a long criminal history; he was once ordered to stay away from his father for a year after the elder Wint petitioned for a restraining order.